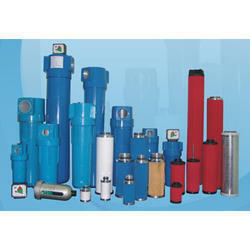 We are a leading Manufacturer of compressed air filters from Sonipat, India. High-efficiency oil removal filtration for the removal of particles down to 0.01 micron including water and oil aerosols. Providing a maximum remaining oil aerosol content of 0.01mg/m3@20°c.Use pre-filter before final filter. Made out of aluminium pressure die castings, pressure tested & powder coated with manual/ auto drain fitting and optional pressure drop indication gauge. Compact Design & optional Differential Pressure Indication. Looking for “Compressed Air Filters”?